This month at our group I made this Brazilian cake known by the locals as Bollo De Fuba in honour of the recently ended Olympics and the upcoming Paralympics. It’s a bit of a dry cake so I recommend having it with tea, coffe , cream or Ice Cream. A great one to have whilst watching people push themselves to the best of there ability. The recipe is available on Jamie Oliver’s website as well as the flourless chocolate cake I did. In a large bowl, whisk the egg whites until frothy using an electric hand mixer. Gradually add the sugar and continue whisking until firm peaks form. Set aside. Sift together the flour, baking powder and fubá or polenta. Set aside. Beat together the butter and egg yolks until light and fluffy. Stir in the milk, then add the dry ingredients and beat until smooth. Fold the whisked egg whites into the batter using slow movements until well incorporated. 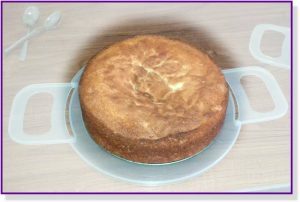 Pour the batter into the prepared tin and bake for about 30 minutes or until a skewer inserted in the centre of the cake comes out clean.